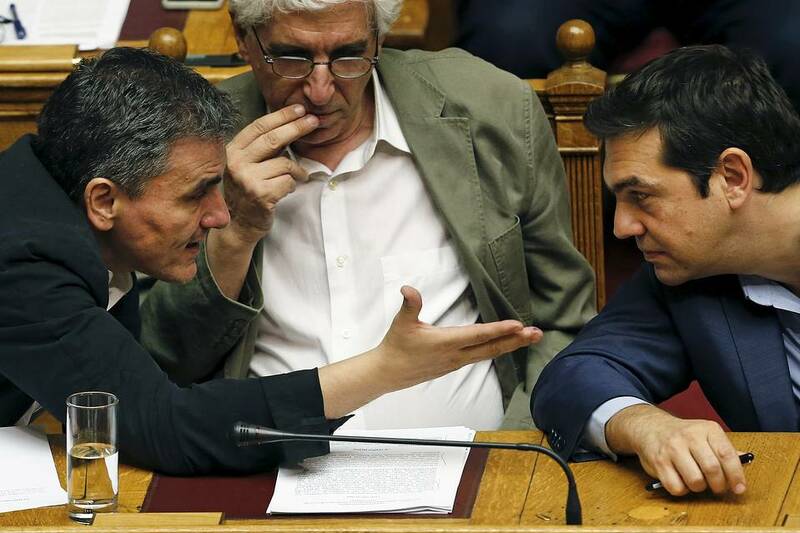 Xekinima (CWI Greece) published a statement after the Greek Prime Minister and leader of Syriza, Alexis Tsipras, signed the latest ‘memorandum’ with the Troika, which described Tsipras having “crossed the Rubicon”. 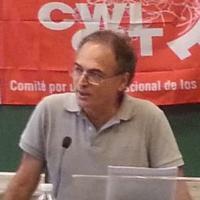 Xekinima went on to call for a “new mass left” in Greece, the first Left organisation in Greece to do so. 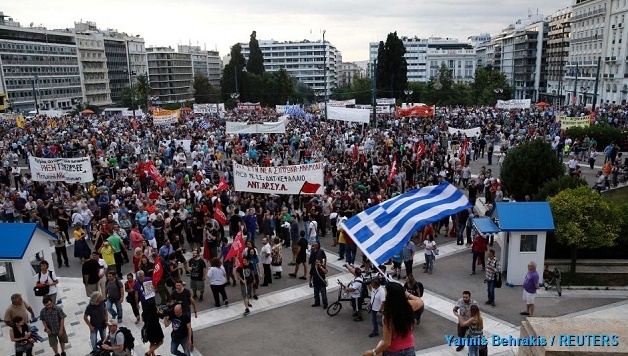 Lucy Redler from Sozialistische Alternative (CWI in Germany), interviews Andros Payiatsos from Xekinima (the Greek section of the CWI), about the situation in Greece and the prospects for new Left initiatives. What is the mood amongst Greek workers and youth? Immediately after Tsipras signed the memorandum, which we had anticipated, because he had been making one concession after another, we put out a call for the urgent need for the emergence of a new mass left force. This is because we had to provide an answer to the huge vacuum on the Left, which was created by the fact that Syriza sold out the ‘NO’ vote in the Referendum on 5 July, when 61.5% voted against the demands of the Troika. This was necessary because of two reasons: Firstly, it was needed to offer the working class an alternative, from the left point of view. Otherwise massive demoralisation in society would ensue. Secondly, if this development does not take place, Golden Dawn would present itself as the only ‘anti-Memorandum force’ and can grow to become an extremely dangerous threat to democratic and workers’ rights. On the question of the mood, we have to differentiate between the mood of the mass of the population and the mood and consciousness of a more advanced layer of activists, in the social movements, the class struggles and the left rank and file within SYRIZA. The mass of the population have not yet understood the effects of the new memorandum because these measures are not yet implemented and people have not gone through this experience. That is why there is a kind of ‘wait-and-see’ attitude and the feeling that Tsipras ‘tried his best’ to fight against the Troika. However Syriza’s support is already falling in the polls. One poll, two weeks after the memorandum was signed, showed a drop of nearly 5% in its support. The masses will understand the full significance of the deal Syriza made with the Troika in September and October, when people will experience the new austerity measures in their day-to-day lives. At the same time, within the left wing of Syriza and amongst activists, there is tremendous shock. Thousands of rank-and-file members, who never thought that Syriza would go to the as far as signing the new memorandum, had always assured their co-workers, colleagues and their periphery that Syriza would never sign anything similar to what Pasok and New Democracy did when they were in government. After Tsipras’ retreat, thousands of activists felt betrayed and ashamed. Many of them did not dare to go out of their houses for many days or face their friends. There are thousands of rank-and-file activists who cried for days. For those people who feel depressed, there is only one way in which not to become demoralized by events: that is to take the step to draw the correct conclusions of the defeat and to take the next step to build a new mass left formation, based on a programme of taking on the capitalist system and the Eurozone elite. Did your call for a ‘new Left’ find an echo amongst activists? With other comrades and groups of the Left we took the initiative to call for a public assembly in Athens on the 17th of July. In fact we only had two days of mobilisation for that event. Despite the short-term mobilisation it was a very successful assembly with 250 to 300 people present and about a least a dozen of different groups of the Left and the main left tendencies inside SYRIZA attended the meeting. This initiative is now called the “July 17th Assembly”. What is the programme of the initiative? What remains of the ‘commanding heights of the economy’ in Greece? It is true that Greece, in the last decades, went through a process of deindustrialisation. But Greece still remains a country in which 30% of GDP is based on exports. Of course, tourism is a big industry and also agrarian production is important, and the same is true for minerals. But actually the biggest share of Greek exports is industrial manufacturing. Of course, we do not have the same giant firms and big industrial manufacturing which exist elsewhere in Europe but industrial manufacturing exports still remain, despite deindustrialisation and the policy of the EU, as a significant part of the Greek economy. Also Greece is a member of the OECD. There is huge potential if there was a proper democratic planning of the economy. In what way is the ‘July 17th Assembly’ initiative linked to developments taking place within the Syriza Left? Through the ‘17th of July’ initiative we try to establish a bridge between the Left inside Syriza, big sections of Antarsya [anti-capitalist left], which understand the need for united action and the building of a mass new left formation, and other forces on the Left, like as ourselves in Xekhinma, and the ‘Initiative of the 1,000’ (in which a number of groups are active). We hold ‘common meetings’ and discussions, which aim at preparing the ground for a new mass Left formation. At this point of time, a pre-congress debate is opening up within Syriza. The Left and particularly the Left Platform of Syriza asked the Syriza leadership for an urgent congress to be called. Tsipras, under pressure from the Syriza rank and file, called a congress for September. What will happen at the Syriza congress? Do you think a split of the party is likely? We think that Syriza is heading for a split. Our position is if Syriza remains ‘united’ after Tsipras’s capitulation to the Troika, as a result of the Left of Syriza giving in to Tsipras in the name of ‘party unity’, this would represent a double defeat. The Left inside Syriza is currently fighting to win a majority of the party to its view. This is correct. However the possibilities of achieving this are extremely weak. We call for the Left in Syriza to link the struggle for a majority at the coming Syriza congress with the demand of leadership change, which they have not done yet. If the Syriza Left loses, which as was already mentioned is the most probable outcome, we think the Left should leave the party and join with the forces outside Syriza to create a new party of the Left. Such a new left party would immediately have enough strength to enter parliament. Does this mean the “July 17 Assembly” initiative should wait for developments inside Syriza? No. The Left forces outside Syriza which understand the need for a new mass Left, cannot wait for the developments inside Syriza. They should use the position they have in the movements and in society, as a whole, which is far from small, to influence developments inside Syriza. If at least eight to ten sizeable independent groups outside Syriza, which however have links with the Left within Syriza, call for a new mass Left formation and base themselves on a united front approach, this can and will have a significant effect on the processes inside Syriza. But there is a second reason why we cannot wait: This is because there are already many voters, supporters and even members of Syriza who are turning their back on the party and we urgently need to offer them an alternative. Through the activity of Xekinima (CWI Greece) in the previous period, we have already established a number of such local, united left initiatives in a number of cities and areas around the country. What are the responses to the local united Left alliances? The response of local communities and local movements to the united Left initiatives has been excellent. They have attracted some of the best elements of the social movements and of class struggles, and from all sections of the Left, both inside and outside Syriza. Just to give you one example: In Volos, a city of less than 150,000 inhabitants, the initiative attracted all the layers I mentioned. Every public meeting of the initiatives attracted more than 100 people, which is quite big for a city of this size. In comparison, a routine meeting of Syriza (without Tsipras speaking) would attract around 150 or maybe 200 people (this was before the Syriza leadership sell-out). We organised similar meetings in Athens, in local communities and every one had around 70 people present. These local initiatives intervene politically in developments, publish press statements and raise the necessity of building a new Left nationally, on the basis of the programmatic points I mentioned before. All in all, these local united Left alliances and 17th of July initiative are not an end in themselves but could serve as a lever to build something bigger in the near future. I should also mention that the Syriza Youth could play an important role in the process of developing a new Left. They published a statement against the memorandum and were present at the 17th of July initiative meetings. Their role should not be underestimated because in the past the youth wing was the stronghold of Tsipras. By the way, supporters of Alavanos, who was the leader of Syriza before Tsipras took over, were present at the meetings of the new initiative. What is the approach of the KKE (Greek communist party) towards new Left initiatives? Unfortunately the KKE, which would have the numbers and strength to re-arrange the map of the Greek Left, refuses to be part of it. They really stand on the side-lines, attacking everybody, and present themselves as the only true revolutionary force. They refuse to collaborate on any level and in any situation with any other organisation of the Left. But the KKE still has an important base. Because people with different opinions to the official KKE position were kicked out of the KKE, the initiative to build a new mass left force will not have an effect on the organised forces of the party. But it will definitely have an effect on the KKE electorate. As far as Antarsya is concerned, it also does not offer a solution because the main developments on the Greek Left will take place around the forces which are either inside Syriza or have a ‘united front’ approach towards the rank and file and the Left of Syriza. There is a crisis inside Antarsya. A big section of it, around 40%, agree with the position that a new mass Left force is required. But the majority inside Antarsya is pushing the idea of organising the forces around the ‘NO committees’ that sprung up during the recent referendum, trying to attract the various forces which campaigned for No. This is not wrong but it is not sufficient. What is now urgently needed is a new political force to step into the political vacuum. Is the building of a Left initiative linked to early elections? We do not have unlimited time to develop this initiative because most likely we will have new elections in autumn. A new mass Left formation must be able to present itself in these elections and it needs to come together with the Left of Syriza. It is important that the Left in Syriza is part of that process. Tsipras will go for early elections in order to get rid of Syriza’s Left MPs. And Tsipras can do so because the Greek constitution allows that. If early elections take place up to 18 months after the previous elections, the parties’ candidates are chosen by the leaders of these parties. That means that early elections could probably accelerate the process of a split inside Syriza because the Left MPs who are inside Syriza know that they will not be put on the party election slate, in electable positions. How much of a danger is the neo-fascist Golden Dawn? As mentioned above, after the capitulation of Tsipras, the only force which seems to be taking an anti-memorandum stand is Golden dawn which despite the fact that the leadership is on trial remains the third party in parliament. The reason why this is the case is because, apart from the sell-out by the Syriza leadership, things are made worse by the sectarian policies of the KKE and the majority of Antarsya, who isolate themselves from the general consciousness in society and fail to respond to the concrete demands of the concrete situation. Because of these policies, the KKE and Antarsya cannot fill the vacuum which exists after the Syriza leadership capitulation. That is why to be successful we need this initiative to come together with other groups and currents on the Left who think on similar lines. It can pass through various transitional stages, may change name, bring different forces together, but, in the end, it must lead to the creation of a mass radical Left force based on a socialist programme. Golden Dawn, in our opinion, is already on the rise. And it will rise more once the concrete measures of the third memorandum start to impact on the lives of Greek workers, from September onwards. Is there reason to be optimistic after the latest defeat? This is not a “final defeat” of the Greek working class in the present historical period. The potential to fight-back is still on the table. The Greek working class has shown that it can return to struggle again and again. This was shown also by the recent developments around the referendum. Nobody expected this magnificent result of 61.5% voting NO. If we are able, in next period, to build a new mass Left in Greece, on the basis of the programme mentioned above, which is now on the table and has some serious possibilities of success, then we can be entirely certain that the Greek working class will return and can actually make an astonishing comeback.